PowerDVD can play MKV, MP4, AVI, WMV, VOB and Blu-ray movies on large screen. It’s an ultra professional DVD multimedia player enhanced with 4K, 3D and ultra HD video support. 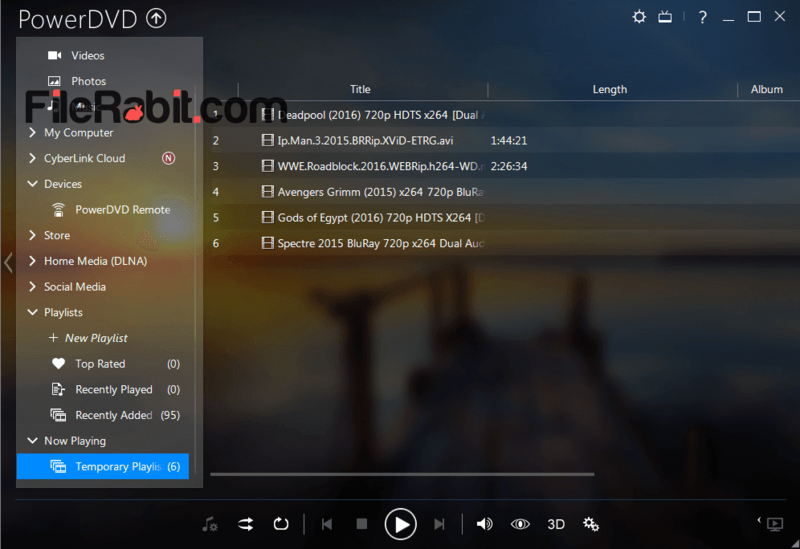 The HD movie playback functionalities are enough to impress a user. There’s already high competition among audio and video players but the lovers of Cyberlink are always love to use PowerDVD as default Blu-ray and DVD player. According to Cyberlink, PowerDVD is most selling product which offers TrueTheater coloring, sounds and resolution as well. Ultra 4K display, Dolby TrueHD sounds and H.265 HEVC are latest key advantages of PowerDVD. Playing 4K movies on a 4K big screen LED will gives a feeling like watching movie in cinema. However, it supports all popular coding and encoding formats e.g. AVCREC, AVCHD, AVC (H.264), MPEG-2 HD, MPEG-4 HD and WMV-HD. The light engine of player take very minimum resources from RAM and CPU usage. WinDVD is one of big competitor of PowerDVD but it will put more load with taking more CPU resources. The laptop battery will be consumed immediately while playing games or watching movies but PowerDVD gives extended timing with its new technology. HDMI 1.3 support: High definition multimedia interface version 1.3 will transfer 8 channels of sound in single stereo cable. This will give higher support to your 5.1 or later woofers. Extended File Support: PowerDVD has added extended file extension support for each audio and video file format. It has playback compatibility for MP4, AVI, MKV, FLV, WMV, Real Media, QuickTime and all audio file extension support. Low System Specs: As mentioned above, PowerDVD will took less system resources as well as very low system requirements. You can even install and use it in a Pentium III computer. Play CDs / DVDs: Play wedding ceremony, birthday party or picnic party DVD videos directly in PowerDVD player with autoplay feature. It will detect and play video discs automatically without disturbing user interface. Hardware Acceleration: New technology added for Nvidia, AMD and Intel CPU’s. This will play H.264 and H.265 HQ videos smoothly without having lags hanging issues.